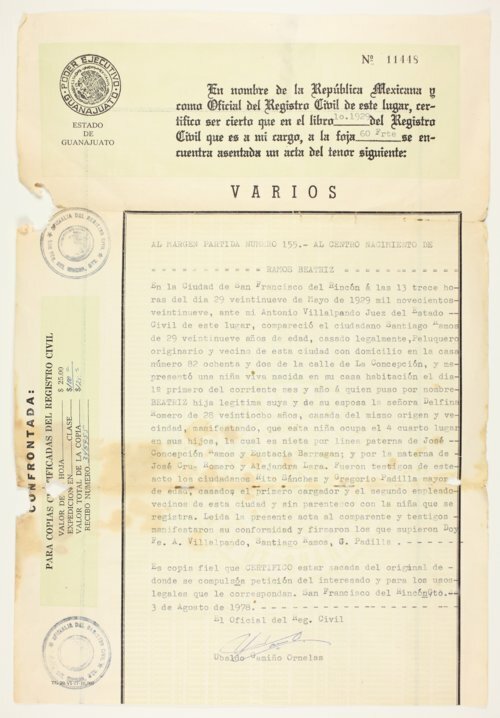 This is a birth record for Beatrice Ramos, who was born in San Francisco del Rincon, Mexico on May 29, 1929. Her family immigrated to the United States in July of that year. Beatrice married Vincent Escobar in Topeka, Kansas, on October 30, 1948. (The couple's wedding portrait is Kansas Memory record no. 89850). She was active in Topeka's Our Lady of Guadalupe Church, and Fiesta Mexicana. Beatrice Escobar died in Topeka on October 13, 2013.